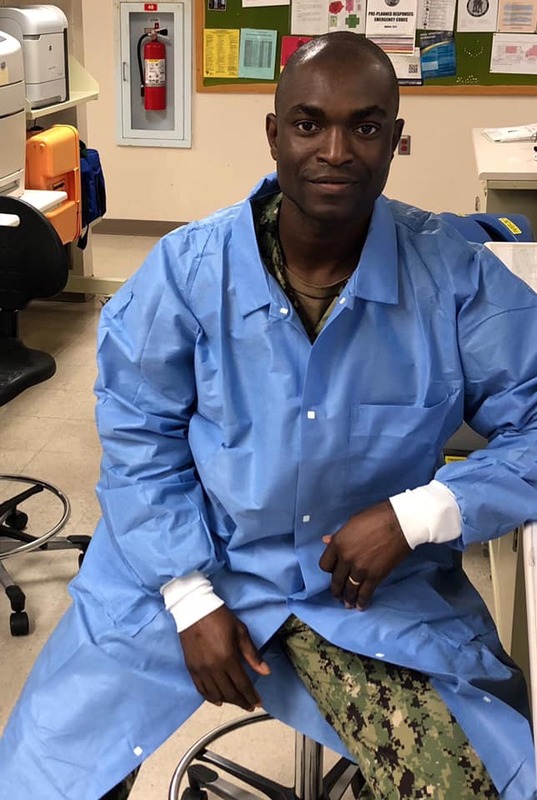 Meet Foster Boadi Amoah in our Medical Laboratory Sciences program. He is our featured student highlight. My name is Foster Boadi Amoah. I am originally from Ghana, West Africa and relocated to Columbus, Ohio in 2013. I am on active duty in the Navy and currently enrolled in the Medical Laboratory Sciences program pursuing my second baccalaureate degree. I chose this program because I am military trained Medical Laboratory Technician, and UAMS – University of Arkansas for Medical Sciences recognized and accepted my previous course work which made me closer to earning my second bachelors degree in Medical laboratory Science. I already hold a Bachelor of Science degree in Agriculture Education from the University of Education, Winneba in Ghana, an associate in Health Sciences degree from George Washington University and a Master of Science in Health Sciences also from George Washington University with a major in Molecular Diagnostic Science. My goal is to become a scholar in the field of Medical Laboratory Sciences with specialization in Molecular Medicine, and also to continue my Naval career as a commissioned officer upon graduation. My favorite quote has always been “where determination exists, failure cannot dismantle the flag of success”. To future students, there are a lot of opportunities in the field of Medical Laboratory Sciences and I will encourage you to explore and pursue a career in this field. You will never be out of a job. In the face of challenges, I take a step back, relax, get help and advice when needed and be responsible for the decisions I make. My motivation are my two daughters Michelle(3 years) & Jenelle (18 months); I want to be a role model and a father they can look up to and be proud of when they grow up.